Sisters in Arms tells the story of women who joined the Queen Alexandra’s Imperial Military Nursing Service in the Second World War. Generally known as ‘QAs’ these women were selected from the higher ranks of society, considered part of the military, held officer rank and nursed on the front line Europe, Africa, the Far East, India and Burma. They were an integral part of the army and they have some fascinating and horrifying stories to tell. I confess that the start of this book did not fill me with hope. There are sentiments early on along the lines of “female nurses just brought that intuitive woman’s touch – those male orderlies could never manage to do proper nursing” which I thought was remarkably unfair on the orderlies and also made a sweeping assumption about the female nurses. But, once the book gets going, as long as you don’t mind the odd lapse into mawkish sentimentality, this is an interesting read. The book starts with many of the ‘young nurses’ being sent out to Singapore and Hong Kong. For many of these it was initially viewed as very much a pleasure posting. There was nice weather, societal engagements and such a strong belief that the war would never reach them that in 1941 an intelligence officer was imprisoned for spreading alarm and despondency by telling HQ that the Japanese were about to invade Hong Kong. They invaded a week later. The brutality of the invasion was awful. “Do English women never cry?” To which Mary gave her immortal reply “not when they have work to do”. But outside of that incident, many of the nurses were raped, made to watch their male colleagues being tortured and killed and then told to tidy up after all of the brutality. When Hong Kong surrendered the Japanese officers regained control of their rampaging troops but resources were still scarce. Then as the remaining wounded servicemen healed, the nurses were turned into prisoners of war. In the POW camps they continued acting as nurses though often their patients died from malnutrition or lack of medicine. Soon the nurses too began to die. There are other sources that will tell you about the horrors of the Japanese prisoner of war camps and the nurses suffered every bit as much as the other prisoners. It is not War Office policy to encourage the next of kin of missing personnel in the Far East to entertain much hope that their relatives are alive; the grim facts of the Far East situation make it most unlikely that any large proportion of them have survived and it is no kindness to raise false hopes. The book ends at the end of the war with other QAs being sent out in hospital ships to bring back the survivors of the POW camps and also concentration camps in Germany. Throughout the war, many QAs were involved in shipwrecks as British ships were hit by U-Boats, planes, other German boats or anything else that can conceivably break a ship. There are some amazing tales of self-sacrifice by the nurses and a fierce determination that as soon as they landed they would immediately begin nursing any other survivors. Yet life on the boats was not all bad. If they were lucky enough not to be attacked then they often had a lot of fun. Boats would have entertainment committees, sports committees and library committees. There would be dances on deck under tropical skies and much is made in the book of there being only a handful of nurses on each boat containing hundreds of charming soldiers. In fact, this is a theme that runs throughout the book. There is also another theme running throughout the book about what the nurses wore, which got a bit dull for me and felt a bit ‘well they are women, what else would you want to know about them apart from what they wore’. Heavens?! They wore trousers?! Whatever next?! There is a heart-wrenching anecdote told by one QA who was fleeing a sinking ship when she heard the call for nurses to volunteer to stay with the injured soldiers even though this would mean certain death. You can only imagine the moral dilemma for a young person with such a fierce sense of duty and yet an equally fierce desire to live when she knew that other nurses were choosing to stay. With only minutes to make up her mind, she, ultimately, fled the boat and survived. We often neglect to remember that the Second World War spilled over into Africa. Here the book gets into interesting levels of detail and we learn about how in one hospital, the rats developed a taste for plaster of Paris and consequently the patients had to beat them off their casts with sticks. We also learn of the importance of checking your bed for scorpions and about an unlikely outbreak of bubonic plague. At its best the book tells some fascinating personal stories and gives an unusual insight into the Second World War, but you do have to wade through a lot of sentimentality. Equally, given the horrors that many of these women lived through, their stories of resilience, grit and classic ‘stiff upper lip’ in the face of everything are unbelievably admirable. Tyrer does at one point mention that the indomitable Matron in Chief, who fought hard for equality and (unsuccessfully) equal pay for the nurses, asked her matrons to send their stories to her so that she could publish them and apparently a book of first-hand accounts ‘Grey and Scarlet’ was published 1944. Sounds well worth a read. 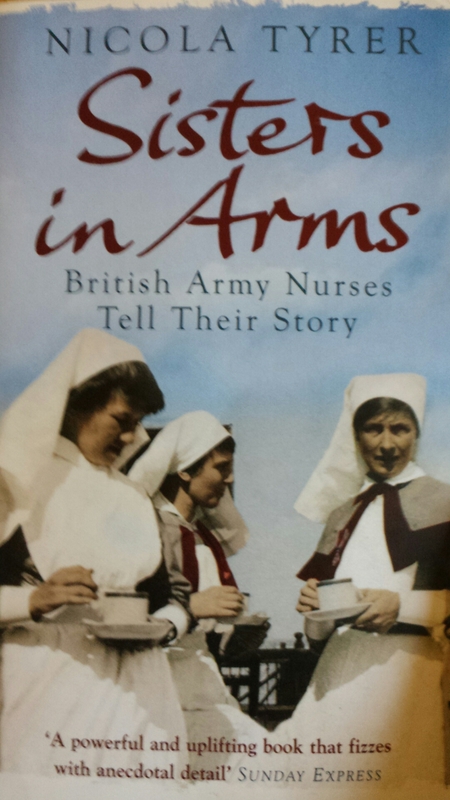 Tags: army, book, book review, books, History, Nicola Tyrer, nurses, Second World War, sisters in arms, WWII. Bookmark the permalink. The stories I heard as a child glamourised the role of the QA nurses. Clearly not the whole story. It really seemed far from glamourous. It is interesting though that, in spite of the hardships, many of them had much more freedom acting as nurses in the war (at least those that didn’t die or end up in a POW camp) than they had as civilians. A lot of them really struggled to return to civilian life at the end of the war. It seemed dull in comparison. It’s so true that we tend, I tend, to forget the war spilled over into Adrica. I am now reading a book of Beryl Markham and Denys and Karen from Out of Africa fame…the author speaks of Beryl’s childhood when the effects of war were felt in Kenya. When does war ever leave us unscathed? Sounds like an interesting book that you are reading. It is always great to find books that shed new light on a subject. How Africa was involved in the 2nd world war is really interesting and I don’t know enough about it. I was really surprised when I was researching at the National Archives at Kew and found that a number of the German and Eastern European refugees that came to the UK after the war came from refugee camps in Africa. Really enjoyed your review of this book – I wonder if the matron’s original publication of these sorts of stories was as prone to sentimentality as this version. I think Matron in Chief wanted the stories to launch a propaganda campaign to get more funding, more nurses, better pay etc so I imagine she may well have tried to tug on the heart-strings too!